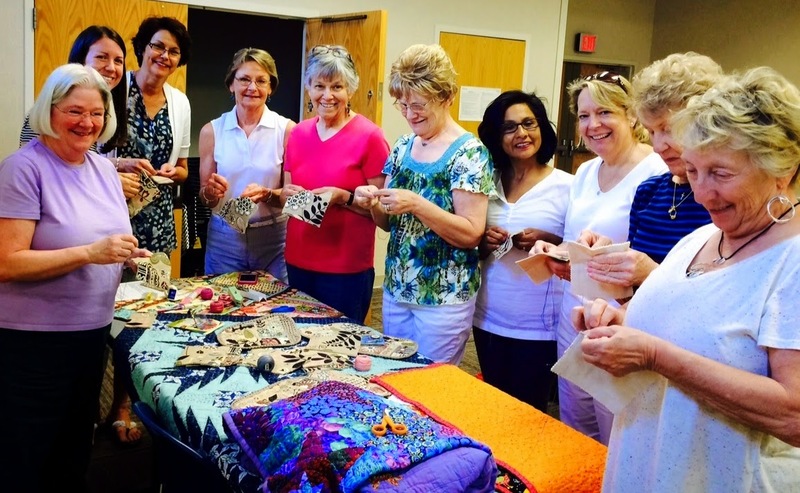 The Greenville Modern Quilt Guild is an affiliate member of the Modern Quilt Guild Guild, Inc. Through a group exemption with the Modern Quilt Guild, Inc., we are a 501(c)(3) tax-exempt entity. We should be receiving our membership cards and pins soon! For those who have paid local dues through the GMQG you can now create an online user name and password by going to this link at the Modern Quilt Guild. You can also upload a picture to your profile. Under the communication preferences you can check to receive the MQG members only newsletter and other correspondence. If you were already an individual member of the MQG, you will continue to navigate the website as usual. Be sure to explore the MQG Community, the members only section of the website. In Galleries tab you can see pictures of challenges, QuiltCon and more. You can find out more about upcoming webinars, lectures and quilt shows in the Events section. You can meet other MQG members from around the globe and discuss the latest topic in the Forums section. And lastly, in the invaluable Resources tab, you will find the patterns of the month, previous webinars and much more. 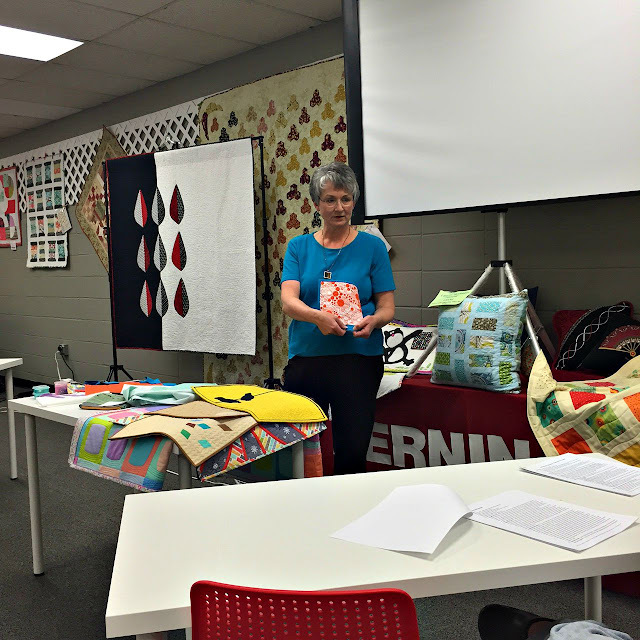 If you are in the Greenville area and interested in learning more about modern quilting please consider joining us for a future meeting. We would love to have you! President Cheryl Brickey called the July 11, 2015 meeting to order shortly after 1pm and welcomed everyone. 17 members and 3 visitors were in attendance. 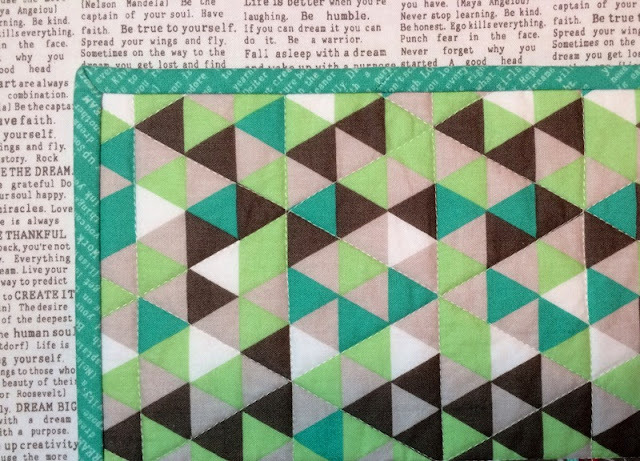 Charleston Modern Quilt Guild is collecting blocks (3.5" x 6.5" unfinished) to be made into a quilt for the Emanuel AME church. Details about the project can be found on their Quilt for Mother Emanuel blog post. They are requesting the blocks by August 1st. Entry is open until Nov 30th for the juried and judged QuiltCon quilt show. The fabric for the 2015 Modern Quilt Guild challenge is The Cottage Garden by Amanda Herring (The Quilted Fish). The deadline is at the end of July. We will present our finished projects at the August meeting. Details are in the April Meeting Recap post. We should be a full guild through the MQG by the deadline for the challenge so members should be able to upload their projects to the MQG website for a chance to win prizes. It's not too late to join in the fun with Cheryl's Midnight Mystery Quilt-A-long which runs through March 2016. Fabric requirements and July's cutting instructions have been posted with sewing to begin August 6th. All instructions are available on the Meadow Mist Designs blog and there is an active Facebook group for the quilt-a-long. A lap-size quilt will be auctioned at a silent auction at a December 2nd fundraiser for the Meyer Center. The goal is to have all of the blocks for the quilt complete by August and to arrange the blocks into a quilt top design at the August meeting. Darleen volunteered to piece the blocks into a quilt top and supply the batting. Fannie has volunteered to do the quilting and Cheryl volunteered to bind the quilt. Dues were collected from 5 new members bringing the total paid membership to 25. All the required paperwork has been submitted and we are awaiting official word that we have become an official chapter of the Modern Quilt Guild. Paige encouraged everyone to enter their quilts into the next quilt show. A great opportunity is the Asheville Quilt Show coming up October 2-4, 2015. There are many categories including Modern Style. The entry deadline is August 24th. Your quilt could come home with a ribbon and if not, you will receive constructive feedback on how to improve your next quilt. The National Quilting Association, Inc. 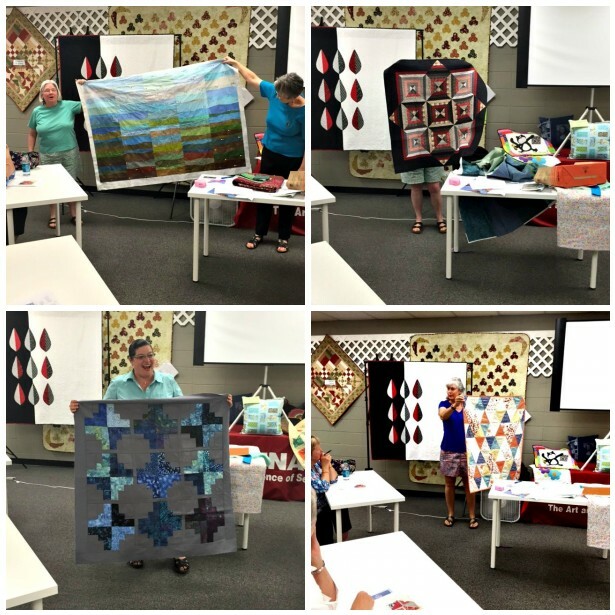 The Modern Quilt Guild Creative Webinar Series, June 2015 – Panel: Quilt Show Jurying & Judging (MQG members only) by Jacquie Gering, Stevii Graves, Shannon Page and Heather Grant. AQS QuiltTV – Scott Murkin, Certified Quilt Judge at AQS QuiltWeek in Paducah He and Bonnie Browning, AQS Executive Show Director, discuss the judging process and various aspects of judging quilt shows. Megan at Canoe Ridge Creations has a double fold binding tutorial with excellent photographs. Part Two is a tutorial for handing stitching the binding. Both of her techniques are slightly different, but will achieve the same great results. A 90/14 needle if you have one. The larger needle will help to perforate the paper template. A few irons along with small pressing mats. I'm thing we could put one small pressing mat between 2 people to share. You will need less than 1/2 yard of the background fabric. I would suggest that you bring at 1/2 yard just in case. The rest of the star requires about 1/4 fabric or maybe a bit more. Darlene will be bringing copies of the templates. We WILL finish the block by the end of the day. We are going to have fun. What would you like to do for lunch? Please fill out this survey so we can decide what to do for lunch (bring your own, purchase a group meal, potluck, etc.). We will announce the lunch decision at least a week before the workshop. Survey link. At the July meeting Paige will talk about entering regional and national quilt shows and how to finish your quilt with a binding fit for a judge. Block of the Month - Album - Red Sky Block by Tales of Cloth. Please continue to use fabrics in blues and greens. President Cheryl Brickey called the meeting to order shortly after 1pm and welcomed everyone. 18 members and 3 visitors were in attendance. 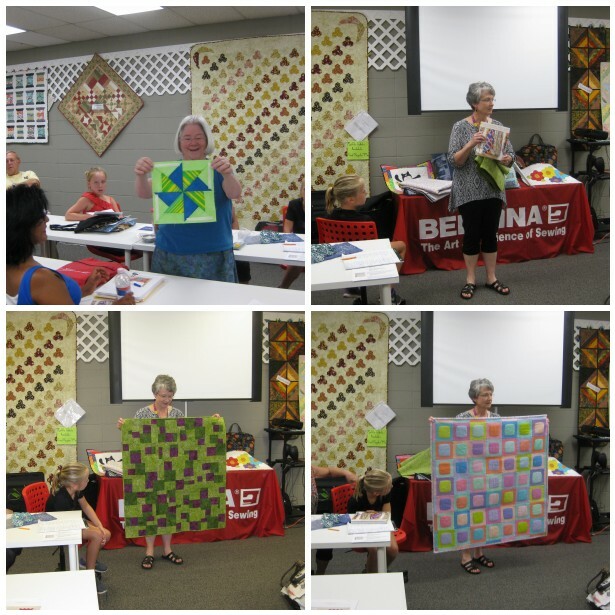 Leslie welcomed the Guild to the Bernina store and introduced Bernina's Row by Row quilt pattern for the summer shop hop. 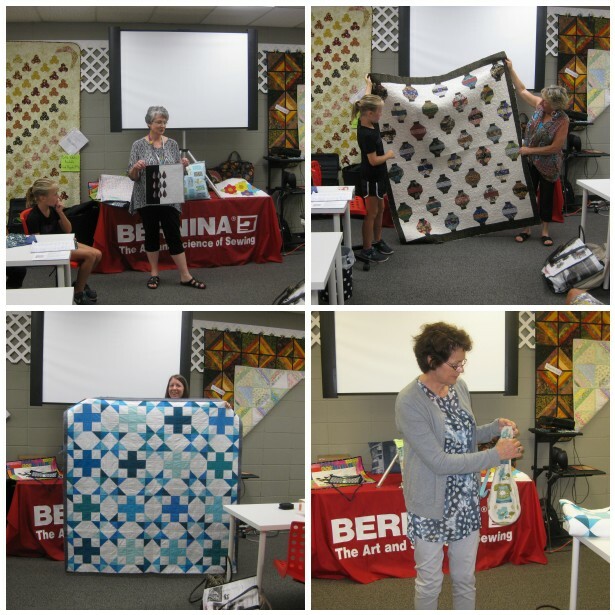 We took a vote and decided that future meetings will be held at the Bernina store. Asheville Quilt Show coming up October 2, 3 & 4. July 11th @ Bernina 1-3pm: Quilt show quilt preparation and binding techniques by Paige. Cheryl passed out June's instructions for fabric requirements for the Midnight Mystery Quilt-A-long which runs through March 2016. Instructions are also available on the Meadow Mist Designs blog and there is an active Facebook group for the quilt-a-long. Treasurer Paige Alexander collected dues from 6 members bringing the total paid membership to 20. Paige is working now to complete and submit all of the required paperwork for us to join as an official chapter of the Modern Quilt Guild. Lynn, Paige, Cheryl, and Debby all had beautiful quilts and sewn projects to show. Faye Jones, with the help of her two lovely granddaughters, Emma and Sadie, gave a wonderful talk about all different kinds of fabric dyeing and surface printing. She had samples to illustrate all of the different techniques. Faye is working on having small groups to her house for a hands on workshop. Without further business, the meeting was adjourned at approximately 3pm.